Chest x-ray; drawing shows the patient standing with her back to the x-ray machine. X-rays are used to take pictures of organs and bones of the chest. 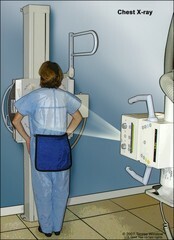 X-rays pass through the patient onto film.